Addamanera Terra Siciliane I.G.T. - Poggio di Bortolone | Saporidoc UK. Addamanera from renowned historical Sicilian winery Poggio di Bortolone. A winery focused on producing high quality modern wines. 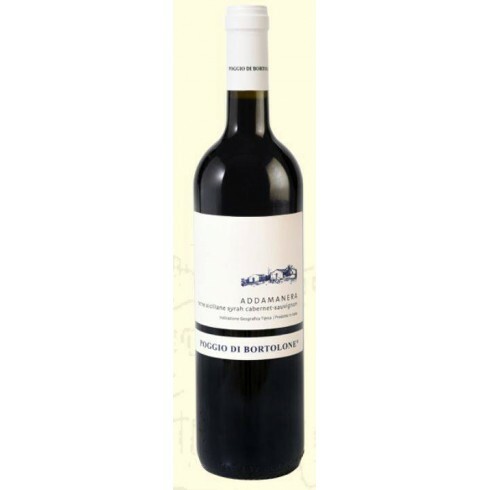 This is a popular and sought-after blend of Syrah and Cabernet Sauvignon which creates a deep red and richly textured wine with hints of green pepper which is typical of Cabernet plus a hint of black pepper from the Syrah. Maturation Aged in stainless steel tanks for about 12 months, and after bottling the wine was aged for a further 4 months in bottles. Bouquet An intense fruity aroma with hints of green pepper and black pepper. Taste Smooth to taste, full-bodied and rich without any sharpness and it lasts long on the tongue. The viticulture practices at Poggio di Bortolone restrict the number of bunches per vine to produce wine of the highest quality that exudes both character and personality. The viticulture is supported by vinification techniques using the latest available technology housed in a purpose-built underground cellar providing year-round temperature and humidity control. The Syrah and Cabernet Sauvignon vines for the Addamanera red wine have an age of 18 years and grow in the Poggio di Bortolone sandy-clay vineyards near Ragusa in South-eastern Sicily at an altitude between 220 and 270 m. The terrain is hilly throughout and therefore the day - night temperature variation range is high, which is ideal for the production of high quality grapes and wines. The grapes were harvested by hand, carefully sorted and destemmed followed by the fermentation on the skins for 12 days at a controlled temperature of 25°C. After the racking followed the malolactic fermentation. The ageing period lasted 12 months in stainless steel tanks and after bottling the wine was aged for a further 4 months in bottles.